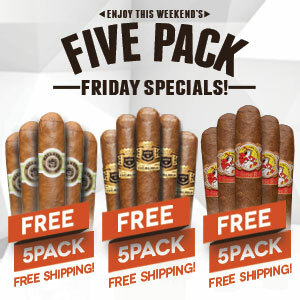 Free 5 Pack with Macanudo Box Purchase - Macanudo Cigars were founded in 1971 by General Cigar Co. They are produced in the Dominican Republic. Macunudo are known for having a smooth draw and mild flavorful profile. They use only thoroughly aged tobacco that is harvested at the most opportune time. It is aged and then fermented to perfection. Asked for by cigar enthusiasts around the world, Macunudo Cigars is the worlds' most popular cigar brand. It is a perfect choice no matter if you're a seasoned cigar smoking veteran, or new kid on the block. Check out the entire line of Macunudo Cigars below including the famous Macunudo Aniversario and Macunudo Café. Free 5 Pack with Hoyo de Monterrey Excalibur Box Purchase - The name Excalibur is known throughout the cigar industry for its consistency and craftsmanship. Excalibur cigars, the original flagship brand of Hoyo de Monterrey, are truly a classic cigar. Aged to perfection, the Excalibur exudes flavors found only in masterfully aged tobacco. Excalibur cigars are smooth tasting, medium-bodied cigars hand made in Honduras with a great draw and priced to sell. Add some of these cigars to your humidor, but be sure to grab extra for your friends. Free 5 Pack with La Gloria Cubana Box Purchase - La Gloria Cubana Cigars have been making premium finely aged cigars for the past two decades. They have risen to the top of the cigar industry. Originally manufactured in the famous Little Havana section of Miami, La Gloria Cubana quickly outgrew its manufacturing facility and moved production to the Dominican Republic. Today, they produce millions of cigars per year for a clamoring crowd of cigar aficionados. Deeply satisfying, La Gloria Cubana Cigars range from medium to full-bodied, and feature a robust smoke. Check out the entire line of La Gloria Cubana Cigars below including the famous La Gloria Cubana Serie R and La Gloria Cubana Trunk Show.